This highbanker is professionally made by Royal Manufacturing - designed by prospectors for prospectors. All corners are rounded and deburred, hardware is permanently pressed in. 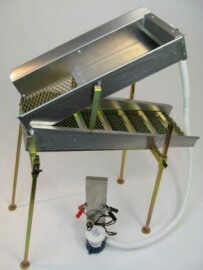 This Highbanker/Recirculating Sluice has four 24" independent leveling legs, gold zinc plated riffles for durability, and expanded metal which creates crevices to capture gold. Folds down to 8" tall x 24" for easy transport and storage. Its big enough to be worked by a shovel as opposed to spooning material in with a trowel.